Which of These Damaged Goods Will Be the Next Rob Brant? Three Punch Combo: Which of These Damaged Goods Will Be the Next Rob Brant? 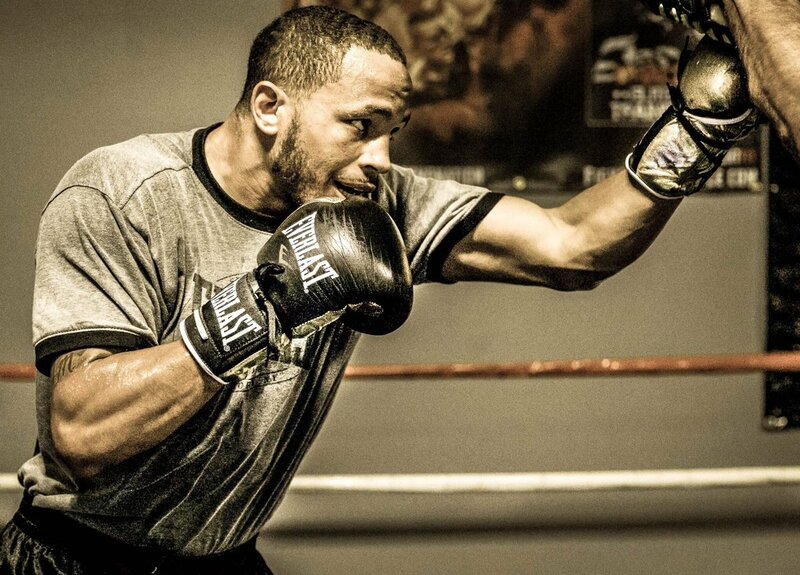 THREE PUNCH COMBO — Rob Brant was once considered a top prospect. He was a decorated amateur and put on some early performances in his pro career that had many thinking he’d be a future world champion. In July of 2017, Brant was 22-0 and accepted an invitation to enter the World Boxing Super Series super middleweight tournament. There were several solid names in the eight man tournament but many thought Brant (pictured) had the tools and talent to win this prestigious event. However, in his quarterfinal match in Germany against veteran Juergen Braehmer, Brant brought nothing to the table and lost a wide 12-round unanimous decision. Brant was not only out of the tournament but many in boxing wrote him off following this disappointing performance. A year later, Brant would move back into contention into his more natural division at middleweight and this time face highly touted WBA world title holder Ryota Murata. Brant was a considerable underdog in this contest in part due to his performance a year earlier against Braehmer, but he stepped up to the occasion and put on a dazzling performance in winning a clear cut unanimous decision. This Friday on ESPN, Brant, who is now 24-1 with 16 KO’s, will make his first defense against Khasan Baysangurov (17-0, 7 KO’s) at the Grand Casino in Hinckley in his home state of Minnesota. The story of Rob Brant is not uncommon. A big time prospect suffers a bad defeat but learns from that loss to bounce back and live up to the high expectations that he once carried. So who could be the next Rob Brant? Here are three possibilities, fighters whose career paths have followed a similar road to that of Brant and could be the next to emerge after disappointing setbacks. Ryan Martin was a highly decorated US amateur with reportedly over 200 wins in the unpaid ranks. Almost instantly after turning pro, he began appearing on top prospects lists and many thought the sky was the limit for him. Blessed with natural athletic ability, Martin showcased his talent early in his career putting on some eye popping performances that reinforced the thought that he’d be a future star. He not only had natural talent and athletic ability but had developed seasoned skills from his amateur days. On September 16th, 2017 Martin received a coveted showcase on the undercard of Canelo-Golovkin I against tough veteran Francisco Rojo. 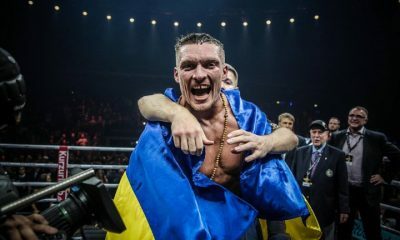 And though he was not as dominant as he was in earlier fights, Martin found a way with his speed to defeat a very capable opponent to move from prospect to contender in the 140-pound division. Similar to Brant, Martin’s next big step would be entering the World Boxing Super Series which was now in its second season. And like Rob Brant, Martin was packed off to Europe. In Scotland, he was pitted against another bright young 140-pound prospect in Josh Taylor. Martin was a sizable underdog, but many thought he’d give Taylor a tough test at the very least with an upset not out of the question, notwithstanding the fact that the fight would be contested on Taylor’s turf . But Martin fizzled out big time. 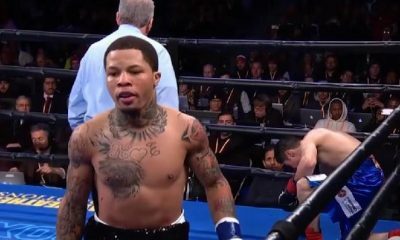 Looking like a deer caught in headlights, he was stopped in round seven in a one-sided contest. Martin has some things to sort out in his career, namely the failed VADA test, but there is no disputing his talent. His natural athletic ability and blazing hand speed cannot be taught in the gym. Did the moment get to Martin? It is entirely possible and just as entirely possible that Martin learns from this setback to come out a better fighter. The loss to Taylor could ultimately be a blessing in disguise for Martin as he enters the next stage of his professional career. Orozco can best be described as a skilled pressure fighter. 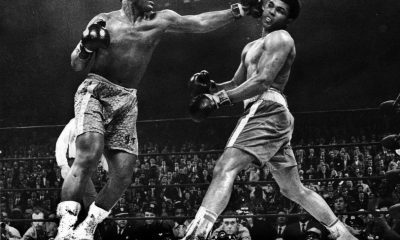 Early in his career, he overwhelmed opponents with his relentless pressure and heavy hands. But as his career progressed, Orozco developed good boxing skills and became a well-rounded fighter. Those well-rounded skills were on display in two superb performances in 2015 against Emmanuel Taylor and Humberto Soto. Orozco applied pressure in spots but also worked effectively behind the jab in winning unanimous decisions in both of those 10-round fights. A world title shot seemed to be just around the corner. But Orozco’s career stalled following those wins. He struggled a year later against journeyman Abner Lopez in a fight in which his defensive liabilities were exposed. There were also issues at the scale and Orozco lost opportunities at a pair of big fights when he failed to make the contracted weight. However, last September Orozco finally got his world title shot against Jose Ramirez. Orozco fought admirably but once again defensive inefficiencies proved his downfall as he dropped a wide decision. Up until the Ramirez fight, Orozco had gotten away with his defensive flaws. If he can get some of these flaws tightened up, he can still make some noise. It is way too early to write him off. Odds are he will find himself with another opportunity sooner rather than later. If Orozco can learn from this loss, he could easily turn that next opportunity into something special. Before he had his first pro fight, Felix Verdejo was already being hailed as the next great fighter from Puerto Rico and a future pay-per-view star. And when he was knocked out by Antonio Lozada last year, many wrote him off as just another prospect who will never pan out. There is no question Verdejo is blessed with amazing natural talent. He can not only punch but has fast hands and is incredibly athletic. But there were red flags leading up to the Lozada loss. As Verdejo stepped up in class against better fighters, his performances seemed sluggish. He didn’t seem to be developing. There were questions about his training habits and how serious he was taking the sport. Sometimes a humbling experience like the one Verdejo experienced against Lozada can be the catalyst for major changes. How bad does Verdejo want it and will being humbled cause him to make the necessary changes to live up to his potential? It is way too early to write off Verdejo. The natural talent that got everyone excited still exists. It is the proper dedication to the sport that was clearly missing. If he commits himself to boxing, Verdejo can bounce back and turn the negative experience of the loss into a positive one for his career. INDIO, Calif.-A Canadian civil war resumed between Montreal’s Yves Ulysse Jr. and Calgary’s Steve Claggett and this one took place 1400 miles south of their border on Thursday night in the Coachella desert. It was 100 degrees outside. 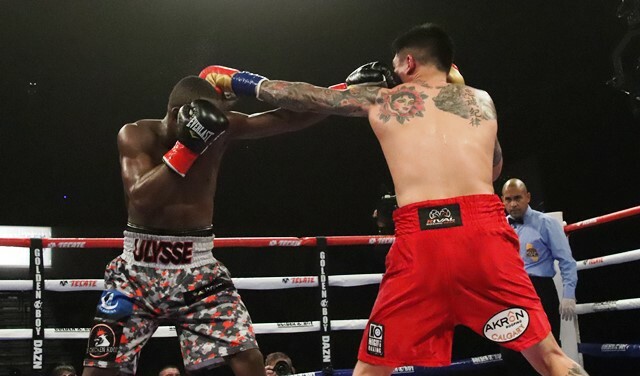 Ulysse (18-1, 9 KOs) pulled out the win in this rematch with Claggett (27-6-2, 17 KOs) before a crowd of maybe 1,000 fans at Fantasy Springs Casino. An earlier clash between the two Canadians saw the Calgary fighter emerge with the win in 2017 in Montreal. It wasn’t to be this time for Claggett who was the aggressor throughout the fight but was immediately tagged by slick combinations from Ulysse in the first round. It was a pattern that remained for most of the fight. Ulysse usually backpedaled from danger but on occasion stood his ground and exchanged blows and deflections with Claggett that was reminiscent of 1950s style in-fighting. It was appropriate that James “Lights Out” Toney was in the audience this night because he’s one of the masters of that lost craft. Maybe the best ever. After 10 rounds of exchanges in an ebb and flow fight the judges scored it 97-93 twice and 96-94 all for Ulysse who wins the vacant WBA interim super lightweight title. In another rematch, Joshua Franco (15-1-1, 7 KOs) started slowly but finished strong in winning the NABF International bantamweight title by split decision over former titlist Oscar Negrete (18-2-1, 7 KOs) after 10 rounds. The last time these two fighters met back in October it was like pouring gasoline to a fire and ended in a draw. This time the title match was more like a slow fuse that got tighter as the rounds mounted. Neither fighter was ever hurt but Franco’s combination punches seemed to be preferred over the single big blows by Negrete. One judge saw it 98-92 for Negrete but the other two saw it 97-93 and 96-94 for Franco who becomes the new NABF titlist. Marlen Esparza (6-0, 1 KO) returned to the boxing ring after having a baby a year ago and powered through Ecuador’s Jhosep Vizcaino (9-9, 3 KOs) with a truckload of rights to win the vacant NABO flyweight title by unanimous decision after eight rounds. Esparza, 28, a 2012 US Olympic bronze medalist, returned to boxing with an immediate attack against veteran Vizcaino who was tentative at first, but mounted a rally in the second half of the fight. But none of the judges felt she did enough to win a round and all scored the fight 80-72 for Esparza. Santa Ana’s Alexis Rocha (13-0, 8 KOs) battled Japan’s Shoki Sakai (23-10-2, 13 KOs) for 10 rounds to win by unanimous decision. No knockdowns were scored in the fight that featured the lefty Rocha against the counter-puncher Sakai in a welterweight fight. 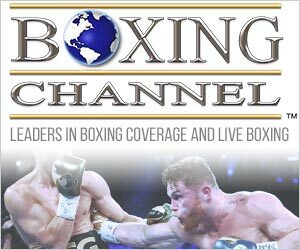 The Japanese fighter trains in Mexico City with Nacho Beristain but was too defensive to get the decision from the judges who scored it 99-91, 97-93 twice for Rocha who wins the WBC Continental Americas title with the win. Former title challenger Mike Reed (24-2, 13 KOs) put a steady beating on Yardley Cruz (25-14,15 KOs) of Mexico in the first round and after 1:45 of the second round referee Eddie Hernandez had seen enough and stopped the one-sided super lightweight fight. Reed fights out of Washington D.C. and fought Juan Carlos Ramirez and lost a regional title against the current WBC super lightweight titlist. This was his first fight in more than a year. Mexico’s Raul Curiel (6-0, 4 KOs) won by knockout over Indiana’s Andrew Rodgers when he could not answer the bell for the third round. During the first round Rodgers slipped at the edge of the canvas after an exchange of blows and seemed in pain. He hesitated to come out for the second round but managed to survive against Curiel’s attacks. At the end of the second round the fight was signaled over by referee Ray Corona. “I hurt my knee when I slipped,” said Rodgers. Coachella’s Anthony Reyes (6-0, 4 KOs) looked like he was knocked down by a left hook from Roberto Pucheta (10-16-1, 6 KOs) but it was ruled a slip in the second round. Reyes then proceeded to use his speed and out-connect the sturdy but slower Mexican fighter. After four rounds all three judges scored it 40-36 for Reyes in the featherweight match. Before his death at the age of 75 on Feb. 3, 2016, Richie Giachetti, the longest-tenured of longtime heavyweight champion Larry Holmes’ chief seconds, proudly spoke of the many contributions he had made in helping make the “Easton Assassin” the great fighter that he was. For his part, Holmes agreed with Giachetti’s glowing self-assessment, but only to a point. Although Holmes described Giachetti as a “master motivator” who deserves to be inducted into the International Boxing Hall of Fame (something that has yet to happen), he declined to give him nearly as much credit as Giachetti reserved for himself. The bond between fighter and trainer can be strong and seemingly as unbreakable as forged steel, and it can be as tenuous as a slender and fraying thread. Sometimes, at alternate junctures in a shared journey, it can be both, as again was made evident when long-reigning former middleweight champion Gennady Golovkin chose to end what had been a highly successful and mutually beneficial nine-year relationship with trainer Abel Sanchez. At first glance, the break seems as shocking as the announcement in April 1970 that John Lennon and Paul McCartney had had a falling out and no longer would be making music together as Beatles. In a prepared statement that was publicly released on Tuesday, the 37-year-old Golovkin, who on March 12 met with the media to announce that he had signed a lucrative contract with DAZN to fight six times for the subscriber-based streaming service through the end of 2021, said his long run with Sanchez had concluded. 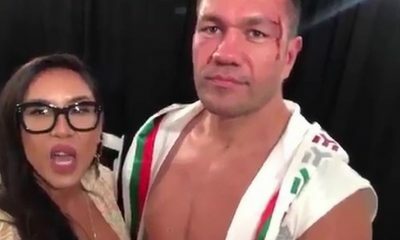 Sanchez was at “GGG’s” side for that occasion, but it now appears that that was the final time they would ever appear together as teammates, as it were, on a common quest. “I would like to announce that I have made a major decision for myself and for my career,” Golovkin’s statement began. “I want to build on what I have already achieved and continue to better myself. Therefore, I will not be training with Abel Sanchez. This was not an easy decision for me and it is not a reflection of Abel’s professional abilities. He is a great trainer, a loyal trainer, and a Hall of Fame trainer. If the kind words of appreciation attributed to Golovkin sounded scripted, it’s because they probably were. The cold termination of what had seemed to be a warm and almost familial association is reminiscent of one of those old TV game shows where a departing contestant is handed a “nice parting gift” that isn’t really all that nice. Contacted by RingTV.com, Sanchez said it was his belief that he was jettisoned for the same reason that so many other trainers in similar situations have been handed their walking papers. As Larry Holmes once noted, once you’ve attained a certain level in your career, why pay hundreds of thousands of dollars to someone who has already taught you all you need to know? “Money. That’s what the nature of it is, money,” Sanchez, hardly sounding conciliatory toward his now-former top pupil, said when asked for a reason that might have precipitated a breakup the trainer neither sought nor wanted. He said Golovkin’s new deal with DAZN would pay him just one-fifth of the cut of the Kazakhstan native’s purses he normally received. “My dignity and pride wouldn’t allow me to do that after nine years of total commitment and taking him to where I’ve taken him. I don’t think I deserved that so I turned it down,” continued Sanchez, the Boxing Writers Association of America’s 2015 winner of the Eddie Futch Award as Trainer of the Year due largely to his work with Golovkin. Sanchez said that, over a period of about three weeks after the announcement of the deal with DAZN, he had an inkling of what eventually would go down. He said the decision to cut him loose was less GGG’s than of some members of the fighter’s inner circle. There are, of course, legitimate and understandable reasons why fighters change trainers. And the reverse is also true, with trainers ditching fighters when it suits their purpose. Teddy Atlas, for one, has walked away from any number of fighters, including champions, because they could or would not adhere to his rigid dictums. Money is a frequent cause for such professional divorces, as is the question of control. Leonard was coming off one of the most significant victories of his career, shocking middleweight champion Marvelous Marvin Hagler after a five-year layoff, when Dundee said he’d been vastly underpaid for that fight, for which he didn’t have a contract, and would only consent to be a part of the Sugar man’s challenge of WBC light heavyweight titlist Donny Lalonde (the vacant WBC super middleweight belt also was on the line) on Nov. 11, 1988, if he had a signed contract and thus would know beforehand what his financial compensation would be. Although Dundee and Leonard never patched things up in a professional sense, they were able to let bygones be bygones. Leonard attended a 90th birthday celebration for Dundee on Aug. 30, 2011, five months before Angelo passed away. The relationship of Roach and Pacquiao lasted much longer – almost twice as long, in fact, at 16 years – as that between Sanchez and Golovkin. But “Pac-Man” apparently took umbrage to a suggestion from Roach after he lost a close and disputed unanimous decision, and his WBO welterweight title, to Jeff Horn on July 2, 2017, in Horn’s hometown of Brisbane, Australia. Roach’s transgression? Suggesting that Pacquiao’s roles as a legendary fighter and a senator in the Philippines each might be so demanding that he could not do justice to both, and thus would be well-advised to choose one or the other. “Being a prize fighter is difficult, but being a world champion is so incredibly difficult,” Roach reasoned. “It takes just about all of your time and focus and energy, and I can’t imagine being able to do it and having another job. With Roach removed, Pacquiao’s good friend, Buboy Fernandez, was his trainer for his next bout, a seventh-round stoppage of Lucas Matthysse. But Roach would not be away for long, nor did many people familiar with their bond anticipate that that would be the case. “They’re like a married couple and it’s like they had a trial separation,” opined Justin Fortune, Pacquiao’s strength and conditioning coach. So Roach was back for Pacquiao’s most recent bout, a wide points nod over Adrien Broner, but in an advisory role with Fernandez remaining the trainer of record. That again will be the case should the proposed pairing of Pacquiao, the “regular” WBA welterweight champion, and WBA “super” welterweight ruler Keith Thurman be finalized. Despite once describing long-enduring middleweight champion Bernard Hopkins as “like my son,” veteran Philadelphia trainer Bouie Fisher sided with his actual sons, James and Andre, in a dispute with B-Hop over how much money Fisher should have received for services already rendered or to be rendered in the future. That is not how Hopkins saw it, and, as was the case with Angelo Dundee’s late reconciliation with Sugar Ray Leonard, the fighter was there when his former trainer and father figure was hospitalized and close to death shortly before he passed away, at 83, on June 30, 2011. When Fisher briefly opened his eyes, Hopkins stepped back and began shadowboxing, the older man’s eyes suggesting a glint of recognition. Floyd Mayweather Sr. fired by Floyd Mayweather Jr. The elder Mayweather had trained his son from an early age, but all that changed when Floyd Sr. was found guilty of illegal drug trafficking in 1993 and sent to prison. Floyd Sr.’s brother, former super featherweight and super lightweight champion Roger Mayweather, took over as Floyd Jr.’s trainer and he guided the 1996 Olympic bronze medalist to the WBC super featherweight championship, his first world title, in 1998. But upon Floyd Sr.’s release he resumed the handling of his son’s career, and some of past friction between them soon became apparent. At the beginning of 2000, Floyd Jr. fired his father as his manager. After one more fight together, Floyd Jr. also fired him as his trainer. Not only that, but the son banned his dad from his training facility, evicted him from a home Floyd Jr. owned and repossessed the car Floyd Sr. was driving. They didn’t speak again for nearly seven years although, in a sure sign that blood really is thicker than water, they again came together much deeper into Floyd Jr.’s record-setting career as the highest-grossing boxer ever. In more than a few instances, the trainer becomes a handy scapegoat, and a handy candidate to get pinned with the blame when a fighter’s career takes a downward turn. That can even happen when the trainer is the fighter’s father. “Sugar” Shane Mosley had lost three of his four most recent bouts when he decided he needed to go in a different direction, and in March 2004 he dismissed his father, Jack Mosley, as his trainer. Jack had trained Shane from the time he laced up his first pair of gloves at the age of eight. In a prepared statement, Shane wrote that “I am going to miss working with my father. Together, we scaled many mountains and I would never have had the success I have had if he had not been there to guide and teach me every step of the way. He is, without question, one of the all-time great trainers. More importantly, he is has been a great father who I love very much. Peter Fury, Tyson Fury’s uncle, was there for the crowning moment of his nephew’s boxing career, on Nov. 28, 2016, when the “Gypsy King” stunned the world by scoring a unanimous decision over IBF/WBA/WBO heavyweight champion Wladimir Klitschko in Dusseldorf, Germany. “Happiest times of our lives,” the uncle said of the conquest of the long-reigning Klitschko. But Peter’s influence didn’t extend so far that he could prevent Tyson from going on an epic binge of overeating, boozing and cocaine snorting that turned his moment of glory into an ongoing train wreck. Peter said he did what he could to halt the freefall, but Tyson had fallen under the spell of “unscrupulous mates” who got him drunk and high every night. Tyson was coming off his signature victory, the first-round knockout of Michael Spinks on June 27, 1988, in Atlantic City’s Boardwalk Hall, and the trainer who had been with him since the launching of his pro career a little more than three years earlier was there to soak in more of the adulation both had become accustomed to. 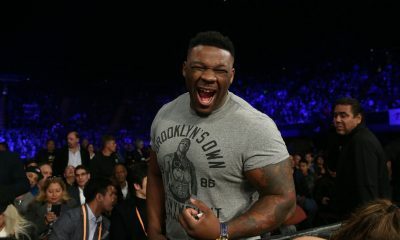 But little did Rooney know that his giddy ride with Tyson was about to end, ostensibly because Tyson’s promoter, Don King, was laying the groundwork to get rid of the trainer – the last link to Tyson’s past and his late mentor, Cus D’Amato – and replace him with the tag team of King sycophants Aaron Snowell and Jay Bright. Rooney didn’t help his cause with his determination to fill a bigger cup with the flood of money being generated by Tyson, a not unreasonable expectation that one writer described as his being “financially ambitious.” So Rooney and his ambition were soon gone, any hope of his ever being replaced forever shattered when, on Oct. 1, 1996, a court ordered Tyson to pay his former trainer $4.4 million for breach of contract. Traveling to downtown Los Angeles can be a perilous journey. When you have 2 million cars battling to go from one direction to another something has got to give. That’s where I come in. My name is David Avila. I don’t carry a badge but maybe I need one. With photographer Alonzo Coston riding shotgun we took off for the heart of the beast LA Live which is located on Figueroa and Olympic Blvd. The Los Angeles Lakers play next door at the Staples Center as do the L.A. Clippers. I don’t follow hockey. One of the most powerful prizefighters of this generation was scheduled to meet with a select few members of the not so secret society known as the boxing journalists at the Conga Room. It’s a quasi-nightclub that was originally started by a few Latin celebrities including Jennifer Lopez. That’s when the Conga Room was on Wilshire Blvd in the 1990s. Two days prior was Easter Sunday also known as Resurrection Day. On Tuesday, former middleweight champion Gennady “GGG” Golovkin met with about a dozen reporters at the Conga Room to resurrect his path to the top of the heap once again. 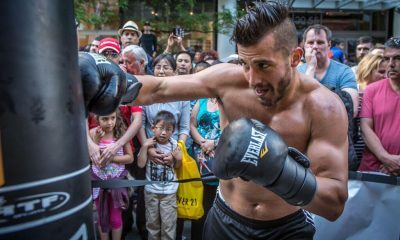 It all will begin with a confrontation against Canadian super middleweight Steve Rolls (19-0, 10 KOs), an undefeated fighter from Toronto, Canada. He once had ties to the late great Emanuel Steward of Kronk Gym in Michigan. Like most Canadians, he’s a nice guy. Golovkin can be a nice guy too especially outside of the ring. But when they meet on June 8 at Madison Square Garden in New York City, don’t count on it. The killer comes out when he steps through the ropes. DAZN will stream. Did I say Rolls is a nice guy? On a side note, it was interesting that Golovkin did not respond quickly at a press conference on Tuesday when asked if he would be preparing in Big Bear. 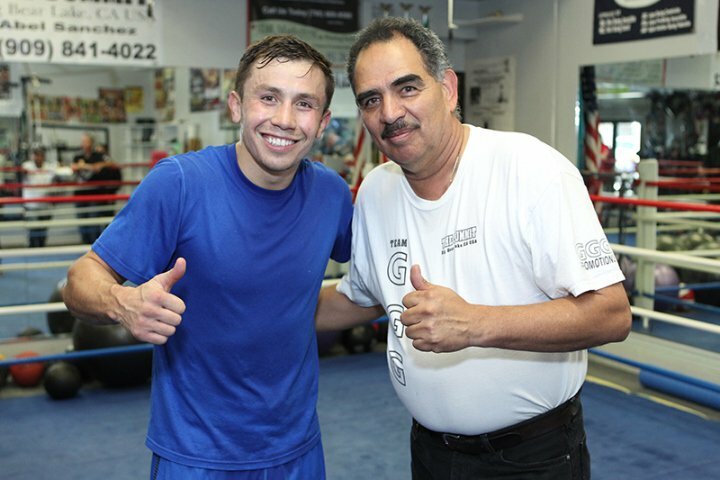 Little did anyone know that Golovkin will no longer be training with Abel Sanchez. A press release earlier today announced the two had parted ways. It also makes sense why the Kazakh fighter opted to fight Rolls. He will need a little time to adjust to whoever will be picked as his new trainer. After both fighters talked about their looming encounter in Manhattan I gathered my partner Coston, who was perched in a strategic position holding a zoom lens ready for action. It wasn’t to be. We’re called into another location near the beaches. We walked back to our car and drove 16 miles through snarling L.A. traffic to Venice Beach. The biggest problem any time you travel west of downtown L.A. is finding parking. It gets even worse when you look for parking at the beach. We located some open spaces about 2.5 miles away from our destination. It was a perfect day, not too hot, not too cold. It took us 30 minutes to reach the area known as “Muscle Beach” where a slew of prizefighters were taking turns shadow boxing on the boxing ring set up near the walkway for the public to see. 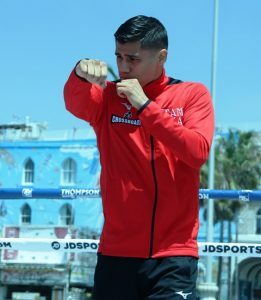 Danny Roman, the WBA super bantamweight world titlist from Los Angeles was dressed in a bright red workout suit and ready for his turn in the boxing ring. 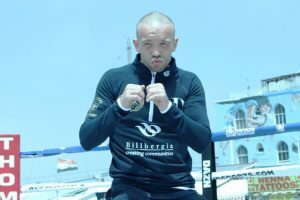 Also nearby was TJ Doheny the IBF super bantamweight world titlist from Ireland. Both were very courteous and respectful toward each other. I’ve been around boxing for decades and when fighters are ultra-respectful like these two that can only mean trouble. I know the signs, I’m a boxing writer. Nobody ever accused me of being a cook. Roman, 28, has the demeanor of a monk going through the ritual of non-communication. His eyes are always looking down as if not trying to show disrespect. He defeated the former WBA titleholder Shun Kubo by knockout nearly two years ago. Then he returned to Japan and beat down Ryo Matsumoto to keep the precious belt. He then beat up a Mexican fighter and a British fighter. I’m not exaggerating when I say beat up. It was virtually assault with a deadly weapon. In spite of his quiet demeanor he’s one of the best fighters to come out of Los Angeles in a long time. He should be put on wanted posters throughout Southern California. He’s that dangerous. “I’ve always said I want all the world titles,” said Roman in almost a whisper. Doheny, 32, looks like a guy whose idea of a good time is traveling to gritty pubs in the most dangerous parts of Ireland in search of somebody to punch. He’s at home wherever he’s at, whether in some part of Australia or on the beaches of California. He pummeled Ryosuke Iwasa to rip the title away last summer. Then he knocked out Ryohei Takahashi who tried to take it away. Bad idea. 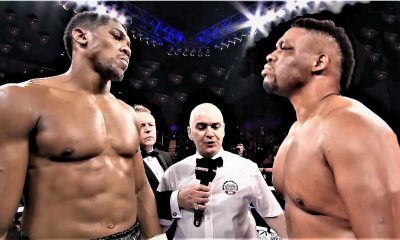 Though he looks antsy to fight at the drop of a hat, he’s almost hush-like when he speaks about fighting Roman on Friday at the Inglewood Forum on the Matchroom Boxing and Thompson Boxing Promotions card. Other fighters were gathered at the boxing ring set up near the beach walkway in Venice Beach. Looking like a male model was former welterweight champion Jessie Vargas a former two-division world champion from Las Vegas. I’ve known Vargas since he was an amateur. Behind that tight guard and interior toughness one could easily determine he would go on to a successful career in acting. What I most remember is his second pro fight in 2008 at Pechanga Casino in Temecula, Calif. He fought a guy named Trenton Titsworth, no joke, that was his name. The guy fought out of Nebraska and was determined to intimidate Vargas. It didn’t happen. So when intimidation failed he resorted to kissing Vargas whenever they got in close. Vargas was shocked as were the several hundred people in attendance. Even the referee David Denkin was abashed. Warnings were given and the fight resumed and then Titsworth did it again and gave Vargas another smooch. What could he do? Well, the referee decided to end the fight and declare Vargas the winner by smoochification. Since that October night I’ve never seen another fight end because of kissing. Biting yes, but not kissing. Of course Vargas proceeded to have a successful career and has won the super lightweight and welterweight world titles. That’s pretty good for a Las Vegas fighter not named Floyd Mayweather. Facing Vargas on Friday will be another former world champion Humberto Soto of Tijuana, Mexico. Soto, 38, has a total of 81 pro fights in his career. Just this past February he took on Brandon “Bam, Bam” Rios and used his boxing wizardry to defeat the rugged welterweight from Oxnard. He’s like the safecracker from the movie “Asphalt Jungle” or better yet, the guy known as “the thinker” who designs the failsafe plans to crack the safe. The Tijuana prizefighter will steal your “chones” if you let him. He once hoodwinked a Las Vegas referee into thinking that he was getting hit with low blows and survived a knockout to the belly by feigning a low blow. In his very next fight he tried the same tactic in California but the referee there didn’t go overboard. He only deducted one point. Though Soto is weak to the body he knows how to fake a low blow with the best of them. He could teach Stanislavski a thing or two about acting. Vargas, who looks like someone who has learned method acting, just might not be prepared for Soto and his Oscar Award ways that allowed him to steal a win from Rios. “I’m very intelligent in the ring and very versatile, it’s about me making sure I follow and execute the game plan and stay on my toes, as you cannot give Humberto any chances as he will take advantage,” said Vargas. Another world title fight pits Thailand’s superman Srisaket Sor Rungvisai (47-4-1, 41 KOs) in a rematch with Mexico’s Juan Francisco Estrada (38-3, 26 KOs) in a battle for the WBC super flyweight world title. The last time these two warriors collided it ended in a majority decision win for Sor Rungvisai otherwise known as Wisaksil Wangek. The Thais like to change their name a lot. Changing names won’t distract Estrada who felt he was badly disrespected by the judges a year ago at the same venue the Forum. He’s made adjustments. Many consider Sor Rungvisai one of the best fighters on the planet pound for pound. After he destroyed former top kingpin Roman “Chocolatito” Gonzalez by knockout he then took his place among the elite. The entire boxing card ranks among the most powerful ever assembled this year. This is like adding nitro to a stick of dynamite. It might be felonious. Golden Boy Promotions has their monthly DAZN fight card on Thursday April 25, at Fantasy Springs Casino in Indio. Special guest James “Lights Out” Toney will be in attendance. If you don’t know who he is then you are probably a casual boxing fan. He’s one of the best ever to lace up. The main event features a rematch between Oscar Negrete and Joshua Franco in a bantamweight clash for the NABF title. Last October these two committed felony assault against each other for 10 gruesome rounds. They were like two angry roosters who refused to give ground and tore into each other on even terms. The fight ended in a draw and justly so. Now they are doing it again. I ran into Negrete’s manager Cesar Garcia and he hopes there isn’t a repeat for the sake of the women and children. Also on the same card will be former Olympic bronze medalist Marlen Esparza returning to the boxing ring after giving birth last year. She hasn’t fought in more than a year, but she will be refreshing her memory against Jhosep Vizcaino in an eight round bout. Esparza was tabbed to face another Golden Boy fighter Seniesa Estrada in a showdown. But pregnancy stalled that collision so now she’s looking to regain traction in this fight. Esparza’s opponent fought Estrada and was stopped in three rounds last summer. She then was stopped by Adelaida Ruiz in two last November. But the Ecuadorian fighter returned to her home and grabbed a win to remind her what a win feels like. Now she has Esparza. We’ll be returning on Thursday, my shotgun rider and I. Traffic going in the other direction isn’t nearly as bad or perilous as going toward the ocean. A return to the desert can be refreshing though predictions for temperatures in Indio will be 100 plus. Outside of sunny California there’s plenty more going on. On Saturday, April 27, the World Boxing Super Series unveils a red carpet for a clash between world champions Regis Prograis and Kiryl Relikh for the WBC and WBA super lightweight champions. Also, Nonito Donaire and Stephon Young meet for Donaire’s WBA world bantamweight title. It’s an enticing lineup that will be streamed by DAZN. 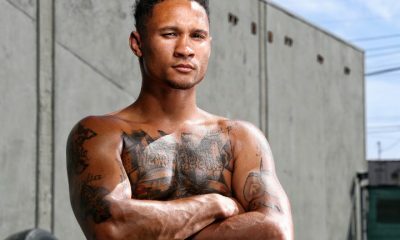 Prograis, 30, a southpaw, trained partly in Southern California for this fight and intends to muscle into the upper echelon of prizefighting. This is another step toward super stardom and a return home to his Louisiana roots. It takes place at the Cajun Dome in Lafayette, La. A female clash between Selina Barrios and Melissa Hernandez could be streamed if time permits. In Las Vegas a pair of staunch lightweights battle for the vacant WBA and IBO world titles when former champ Robert Easter Jr. and Rances Barthelemy meet at the Cosmopolitan on Saturday April 27. Showtime will televise. Easter returns to the ring after suffering the first loss of his career last year against the hands of Mikey Garcia. Barthelemy, 32, lost for the WBA super lightweight title to Kiryl Relikh who fights on the same day against Prograis. Both Easter and Barthelemy feel naked without a strap wrapped around their waists. Former super featherweight champ Jezreel Corrales of Panama is also on the Las Vegas fight card but this time in the lightweight division. He lost his title by knockout to Puerto Rico’s Alberto Machado who also lost the title to California’s Andrew Cancio by knockout. There’s a lot of knockouts going on, somebody has to get to the bottom of this. Again, my name is David Avila. I don’t carry a badge but boxing is my game.